Russian troops invaded Crimea in late February 2014 in response to the Euromaidan Revolution in Kyiv. Pro-Russian Crimean authorities signed an annexation pact with Russia on March 18, 2014, to formalize the first forceful change of a European border since the end of the Second World War. The European Union and the United States do not formally recognize Russia’s land grab, and have imposed economic sanctions on Russia to punish its aggressive actions. But EurasiaNet.org has learned that Russia is trying to use “the beautiful game” to poke a hole in the EU’s non-recognition stance. Specifically, Russia is pressing UEFA, the European governing body for football, to recognize Crimea as an entity apart from Ukraine. UEFA is expected to make a decision on the matter in late March. If UEFA officials go along with Russia’s preference, it could establish a precedent that the Kremlin could use to steadily erode the EU’s non-recognition resolve, and drive a wedge between Europe and the United States on the issue. But Russian officials did not let the matter rest there. They came up with a plan to form a separate eight-team Crimean league, grouping the Sevastopol, Simferopol and Yalta teams with five heretofore amateur squads. If UEFA approves the plan, the league could begin to play as soon as April, with the season running through the fall. Laurinec acknowledged that UEFA’s decision could have political implications, even as he sought to distance the football body from responsibility for any potential political fallout. Adopting an Olympic-style stance, he pleaded that sporting affairs and politics should be considered separately. Trubetskoy indicated that Ukraine would not be opposed to UEFA efforts to help sustain football in Crimea on the youth level. The matter of the league is more complicated, he added. Ukraine would be steadfastly opposed to any participation by Crimean clubs in UEFA-sanctioned European tournaments. Laurinec said Crimean representation in such UEFA competitions is not currently under consideration. 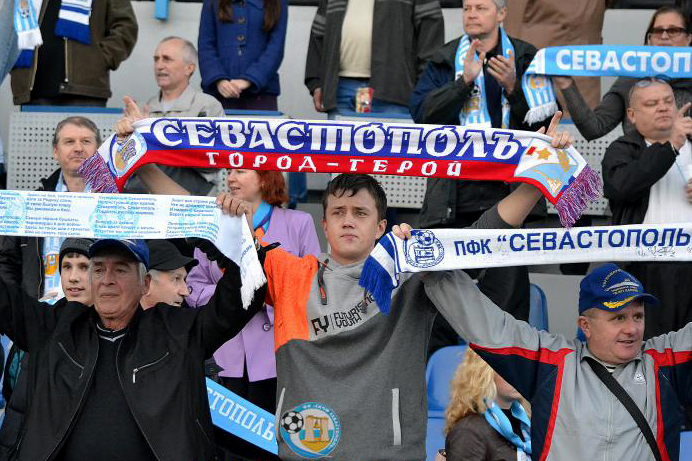 Ultimately, a Crimean league would have a tough time surviving without a massive infusion of Russian funding. And with the Russian economy being battered on all sides, the necessary financial support is unlikely to be forthcoming. The viability of the league may not matter that much to Russian football officials, so long as they gain UEFA recognition of the league as an entity apart from Ukraine. Emanuele Giulianelli is a freelance sports reporter based in Italy.